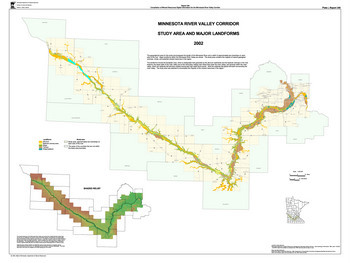 Report 340: Compilation of Mineral Resources Digital Information for the Minnesota River Valley Corridor. Plate 1: Minnesota River Valley Corridor, Study Area and Major Landforms. Plate 2: Existing Pits and Quarries for All Mineral Commodities. Plate 3: Current Resources and Potential for Quartzite, Granite, Silica Sand, and Limestone. Plate 4: Current Resources and Potential for Industrial Clay. A zip file containing GIS data and associated metadata (zip file, 47 mb). A summary file of the data found in the zip file.